My task today is to compare and contrast two illustrious sons of the Niger Delta Region. They are Rotimi Amaechi and Godswill Akpabio. Maybe I shouldn’t have added ‘’illustrious’’ because they have illustrated very little outside self-aggrandizement. Amaechi literally came from nowhere to become so rich and powerful. Before 1999, his entire life and livelihood had been defined by Dr. Peter Odili, who was Rivers State governor between 1999 and 2007 and owns Pamo Hospital where Amaechi had worked as a public relations officer before his astronomic rise to Speakership of the Rivers State House of Assembly. Akpabio may be a little deeper, but I shall return to him presently. Both Amaechi and Akpabio were born in the early 60s, went to universities in different locations within the Niger Delta region; Port Harcourt and Calabar which are about 250 kilometres apart, and studied English and law respectively. Two of them have been active players in the ongoing democratic dispensation which started in 1999. 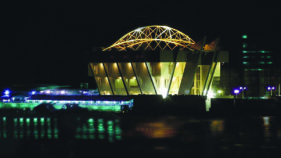 Between 1999 and 2007, Amaechi as the Speaker of the Rivers State House of Assembly was the number four citizen of the state after the Governor, Deputy Governor and Chief Judge. In the same period, I suppose, Akpabio was a commissioner in Akwa Ibom State under former Governor Obong Victor Attah. At the end of that dispensation, both men upscaled to become governors of their respective states under turbulent circumstances. 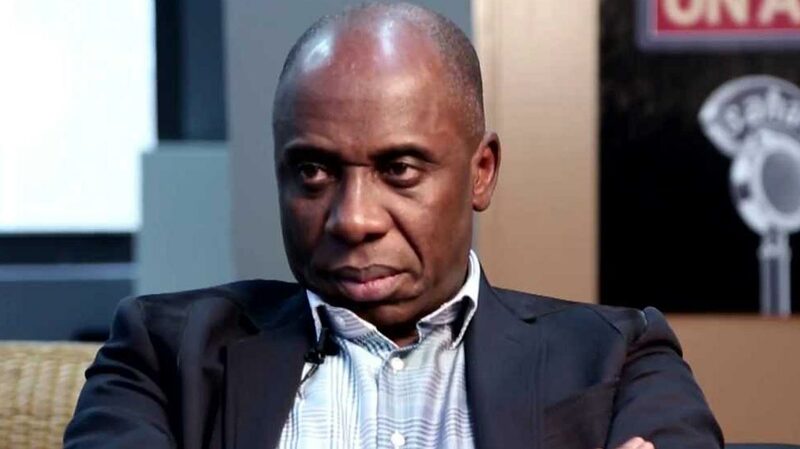 Amaechi’s bid for the governorship was actually k-legged until the judiciary got things straightened out for him. Regarding Akpabio, Victor Attah had wanted another successor, specifically his son-in-law, but failed spectacularly to swing things around in spite of his incumbency powers. In a way, therefore, both men, Amaechi and Akpabio, had their hard nuts cracked for them by a benevolent spirit. Knowing this, why they forgot to be humble is what is baffling. Amaechi actually swaggers like a local chief. He seems not interested in cultivating elevated attitudes. He talks big and brash and thinks all matters can be settled in the battlefield. In any case, he is not afraid of battles. He fights his enemies from dawn to dusk and back to dawn, and to finish too. He is not like many others who quarrel in the day and make peace in the night. Although he touts some deep Catholic faith, he seems to believe more in his methods than in God’s time. And so far and good, his armour has not failed him. Overall, Amaechi is a man of action and single face. Before I say anything about Godswill Akpabio, I would like to confess that circumstances had brought us together in our formative years and I know him a little deeper than I know Rotimi Amaechi. We were together at the University of Calabar for four years; between 1983 and 1987. He was in the Faculty of Law while I was in the Faculty of Arts. His politics started from school when he was elected clerk of the Students Parliament. Back in school then, he was just manifesting. And what marked him out was his soft oratory amid smiles. He called his schoolmates ‘’my sons’’ and ‘’my daughters’’ in a manner that invoked admiration instead of contempt. To him, every sidebar engagement was also an opportunity to filibuster in an apparent display of his oratorical prowess. Even at that early age, Akpabio, an Annang, knew that given the demographic configuration, he did not stand a good chance in the campus power game outside his Ibibios brothers and sisters. He had latched on to them to make headway. And since then, he has been latching on to people, things and situations to have his way. Our paths crossed again in Lagos at the meetings of the University of Calabar Alumni Association. Boisterousness is another trademark of Godswill Akpabio. He has the capacity to induce entropy to offset an existing order and then reorganise within the resultant disorder to achieve his purpose and move on. At our Alumni meetings in Sheraton, Ikeja, Lagos, he would enter with an overwhelming ambience that made the rest of us appear shorter than the common platform. He seemed relatively buoyant as company secretary of EMIS, a private telecom company. He would pick the bills just like that and then speak to the group with the finality of a paymaster. When the time came to change the leadership of the alumni association, he brought so much to bear, not necessarily in terms of cash, but with his mesmerising sophistry. Before anyone could articulate a counter move, he had had his way and moved on. When he was a governor, I had met Akpabio a couple of times although each time he maintained a cold distance as if to say he attended Oxford University in the UK, while I attended the University of Calabar in Nigeria. Not even the Unical solidarity catch-word of ‘’Malabite’’ to which the addressee would respond “action/asksion’’ could elicit in him the right enthusiasm. It was his own way of creating defences against sundry acquaintances. In all of the experiences, Akpabio has remained the same. Ever cheerful even in agony, he is a grand master of subterfuge. His position is never betrayed by his poise and his real intention only manifests in the very long run and not in the short run. He desires by avoidance and perpetually restless in his own power dynamics. Every of his move is a tactic within a larger strategy to realise an ultimate goal. He May look left when he actually wishes to move right. Quite unlike Amaechi, Akpabio cannot stand in as a reliable right-hand marker in a parade formation. He does not stand fast in one location and can move in as many directions as there are available paths to follow and still remain focused on his purpose. It is perhaps the reason why Obong Victor Attah with all his monumentality could not hold Akpabio in place in the build-up to the 2007 governorship election in Akwa Ibom State. While Attah was fighting the PDP establishment in Abuja to finish, Akpabio was cultivating big time the same establishment through the then Secretary to the Government of the Federation (SGF), Obong Ufot Ekaette. He had the acumen to appreciate that under the presidency of Olusegun Obasanjo with the Kogi-born ‘Garrison Commander’ Ahmadu Ali as PDP chairman, allocations of party privileges and even rights was done in Abuja and not in the state capitals. He was correct and the rest is now history. The impression he gave was that the hawks in Aso Rock refocused the heart of Jonathan from acknowledging his (Jonathan’s) real supporters, which included him (Akpabio). Yet Akpabio’s narrative of events can hardly be challenged because he enjoys this child-like disposition that enhances his innocence. Even in contexts where he is the clear villain, he plays successfully the victim and sustains the lie. 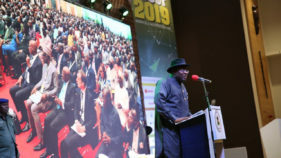 He was kind of saying that things would have turned out differently if he had been made the Director-general of the Goodluck Campaign Organisation. His listeners believed him and blamed Jonathan and his wife for their shallow perception and judgment. Today, both Amaechi and Akpabio have left the PDP for the APC. The former’s plight was understandable. Amaechi had faced extinction in the PDP and fled in self-preservation. Consequently, no justice system; in the social and natural settings, can hold anything against him. He ran so that he could live to fight another day. What about the latter? Not even Akpabio himself has been able to say precisely why he left the PDP for the APC. And because information on his motive is scarce, the conjectures have become many. 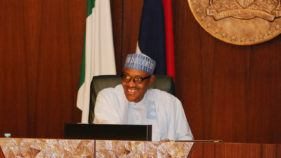 Some are even saying he saw tomorrow and sowed seeds across party lines, funding the PDP his own party and the then opposition APC in the last election at the same intensity, and that he waited this long before re-aligning to have a proper assessment of the new power dynamics under the APC-controlled Federal Government. Others say a thousand demons including the Economic and Financial Crime Commission (EFCC) are baying for Akpabio’s blood in restitution for some wrongdoing. Therefore, his flight from the PDP to APC is to avoid sudden death. Whichever, Akpabio in comparison with Amaechi has acted in a far less honourable way even as both men remain united in their inordinate quest for self re-validation. Like a chameleon, Akpabio assumes the physical characteristics of the surrounding environment as a survival strategy. He is cowardly, self-centred, unstable and less able to work for the resolution of the issues in the Niger Delta. On the other hand, Amaechi is a lion-heart who unfortunately preys on his environment and may have nothing standing for him in the end. The choice between the two is therefore like a choice between the devil and the deep blue sea. With deep reflection, however, the latter seems a better option because it contains the prospects of God’s intervention. But a date with the devil is sure death. I have said enough to earn the day. I will now leave you with the simple task of establishing the Devil and the Deep Blue Sea between Amaechi and Akpabio.